Not so much of a mall pun... TESCO je... Hahah. Sofia jalan-jalan a lot last Sunday! In the morning we took her to the clinic to get her two months injection, and in the evening we went sightseeing. After dropping off mum at Bukit Mahkota Clubhouse, we got about two hours to spare. Iz was like, what can we do in TESCO for two hours? The most we could spend there is 30 minutes, kut. Man, oh man. We can do a lot in TESCO for two hours! We can buy groceries, get Sofia (and I) new clothes, find miscellaneous stuffs at MR. DIY, and have a drink at the foodcourt. HAHA. Guess I was being too ambitious. I am so glad I followed Iz's plan. This man is so realistic. We went sightseeing for the first one hour plus; only stayed in the car as Iz drove around Bandar Seri Putra and Bangi Avenue (Bangi Wonderland Themepark and Resort is huge!). Sofia? Well, she slept the whole time on my lap. I was really excited when we finally get to TESCO. Again, HAHA. Iz was kind enough to help carry Sofia around. Still sleeping, little miss Sofia. Honestly, I was really excited! It has been two months weh tak keluar rumah! Went to find Sofia's clothes. Eyes open already, but still quiet. Good. Good girl, good good. We may proceed. Went to find my clothes pulak. Still quiet, good good... The dude carrying Sofia? It was as if he was holding a time bomb, ready to burst. Cepat cepat try, cepat cepat gi bayar... He rushed me. I only laughed. Hahaha... Tak payahla takut, dia okay je tu. A VERY CONFIDENT MUM. When we entered MR. DIY, Sofia looked uneasy. Dah mula uh ah uh ah... Okay okay, I got it. And that, belum sampai setengah jam pun lagi. I am so glad there is a nursing room. 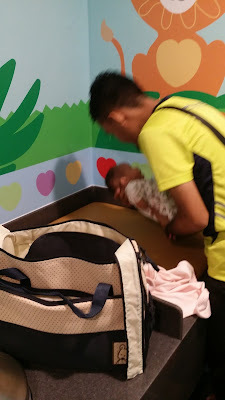 It was my first time using a nursing room; there are changing stations and also a nursing section divided by a curtain. Iz changed her diaper and then let me nurse Sofia. Oh it was so hard to nurse Sofia! She must be so hungry she refused me. Dah lapar nak cepat so she wanted formula milk, I assume. That time I was the one holding a time bomb. It was so hard to get her to calm down to feed her! Alhamdulillah, after struggling, she finally calm down and latched on me. We then decided that's enough let's just leave. On the way to the carpark, lalu kedai baju. Eh Sofia pun macam senyap je... Macam okay je... We went back inside! Hahahahah! But only to the clothes shop, which is very near to the entrance. Spend only a few minutes, didn't get anything, didn't try on anything. In the car, again Sofia wailed. Wrestled again to feed her... Finally she understood I couldn't give her formula milk. She latched on me until we reached Bukit Mahkota Clubhouse. So there.